Court of Justice of the European Union has overturned the ruling in accordance with which Bank of Latvia governor Ilmārs Rimšēvičs was suspended from his post. In its verdict the EU Court explained that even a temporary prohibition to perform duties can be considered a suspension. As it is known, Latvian Corruption Prevention and Combating Bureau send materials of the criminal case involving Rimšēvičs and businessman Māris Martinsons to the prosecutor’s office for commencement of criminal prosecution in June 2018. Shortly after that the prosecutor’s office raised charges against Rimšēvičs for bribery. Martinsons was accused of supporting bribery. Rimšēvičs had previously claimed at a press-conference that he is innocent and that he has no intention of stepping down from his post in the Bank of Latvia. He called the crimes incriminated to him as politically motivated defamation campaign. His duties are currently performed by vice-governor Zoja Razmusa. KNAB detained Rimšēvičs a year ago. Viorika Jirgena, supervisory prosecutor for the case, reported in summer 2018 that KNAB had commenced the criminal case following a request from shareholders of the now liquidated Trasta komercbanka. The two shareholders are bribers in the criminal case. However, they were relieved of criminal liability because they voluntarily turned to law enforcement institutions with testimonies. Jirgena said one of the shareholders had turned to Rimšēvičs in 2010 with a request to settle affairs with Finance and Capital Market Commission. 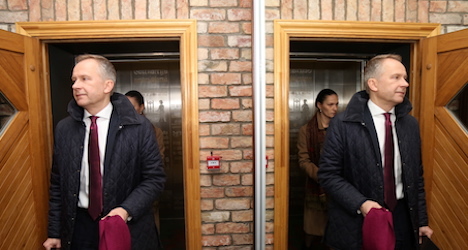 In exchange, the governor of the Bank of Latvia was offered a paid trip to Kamchatka. In 2012, the same shareholder together with another one turned to Rimšēvičs, asking him to assist in matters associated with FCMC. Rimšēvičs requested EUR 500,000 as payment to be paid in two parts – one before and one after settling affairs with FCMC. The prosecutor stressed that after the meeting in 2010 Rimšēvičs had provided several consultations to Trasta komercbanka shareholder, thereby attempting to influence FCMC’s decisions. Consultations were provided after the 2012 agreement. However, even though Rimšēvičs had managed to influence FCMC’s decisions in a way favourable for Trasta komercbanka, FCMC had made decisions that were also not beneficial for the bank. One of forms of assistance Rimšēvičs ahd provided, the prosecutor mentioned preparing answers to questions asked by FCMC in relation to the bank’s liquidity. Jirgena also explained that because Rimšēvičs had failed to fulfill his promise, he was only paid EUR 250,000. According to the prosecutor, Martinsons played the role of a mediator in this crime. The businessman also received 10% of the bribe. Foes that Martinson have any pure legal and transparent business? How it is possible that his kind of person just continues businesses? Nobody cares in Latvia?